SEM observation at an atmospheric pressure as well as under vacuum. Wet specimens can be observed in their natural state without preprocessing. 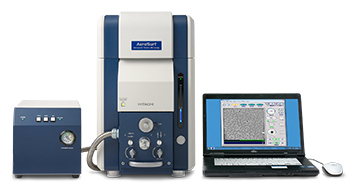 Hitachi developed a new concept in scanning electron microscopes, the AeroSurf. The hybrid tabletop atmospheric SEM (ASEM) has an extremely thin membrane which separates the evacuated column and atmospheric-pressure chamber, enabling the observation of typically difficult specimens, such as bulk or wet samples, in their natural state.